Dark Tonic Games Studio: Oh, you like the Zerg? Oh, you like the Zerg? 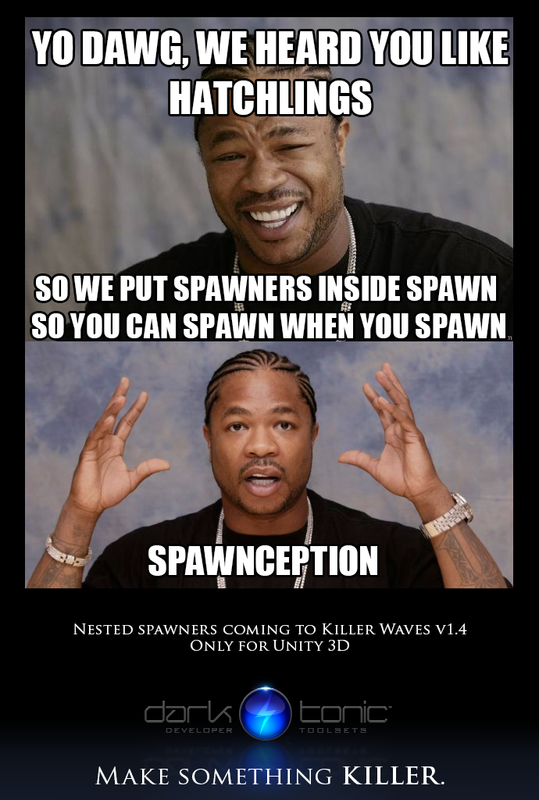 Killer Waves v1.4 is coming soon! The code is done for this massive upgrade (should really be called v2.0! ), we just need to update the documentation and make a cool example scene to show off all the new stuff. 1) Added "is enabled" checkbox for spawners. 2) Added "Game Over Music" section at top of Level Settings. Your existing music settings will probably be lost, please check them after updating to this version. 3) New "silence" option for music waves. 4) Added "Music Fade Time" for Silence music mode to fade previous music out over time automatically. 5) Fixed bug where the same prefab would be spawned for each item in the same frame, even in a prefab pool. ★ enemies that spawn more enemies ★, enemies that spawn waves of projectiles, prefabs that spawn waves of things when destroyed, spawners that only spawn after they've scrolled onto the screen and a lot more. Very flexible. These are completely independent of the global Level Waves. 7) Collision and Trigger events have an optional layer filter and tag filter fields so you can trigger things only between certain layers and tags. 8) "Despawn prefab" checkbox for certain events such as Collision & trigger so you don't have to code that. All that and we still have a solid backlog of features to come! The new version will be going up in price so we recommend adding Killer Waves to your project now and saving yourself some money. Video of all the new features coming in a week or so.